Novice DIYers can take heart from the story of Mandi Gubler, a stay-at-home-mom who had zero experience with crafting until she started her blog. Today she's gained a following as a "fearless" decorator who isn't afraid to take on any project. Topics that she has tackled range from creating a leather journal to reupholstering a sofa. Looking for a natural face scrub or some jazzy cocktail stirrers for your next party? For the Makers can show you how to make these items and other health and beauty products, jewelry, home decor accessories and much more. Projects are categorized into thematic collections so you can mix and match looks. Giving new life to outdated items is an eco-friendly way to get a fresh look. 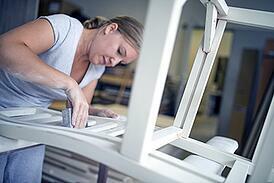 Carrie Waller takes you through the steps of renovating tables, chairs, headboards and hutches. You will also find tips on creating shelving, arranging flowers and making your own photo frames and picture magnets. Don't let the name fool you. This is not a sewing-centric blog. It grew out of Amber Kemp-Gerstel's love of card-making and stamping and now encompasses DIY entertaining, home decor projects and recipes. Recent posts include how-tos for stenciled coffee mugs, canvas tote bags and desktop planters. This blog's motto sums it up perfectly: "Vintage, Home Decor and Big Messes." As a military wife with three kids and a dog, Rachel Denbow is well-acquainted with all three. Along with entries about DIY projects and lifestyle tips, Rachel offers a selection of e-courses on topics like scrapbooking and journaling. Let your kids in on the DIY fun with this blog that helps youngsters nurture their creativity. Barbara Rucci is a working artist and teacher who believes that every child is born with an artistic sensibility needing care and feeding to stay with them into adulthood. Kids will have a blast with her colorful projects like paper mâché ice cream sundaes and washi tape leaves. We would love to hear from our creative-minded readers. How have you added DIY flair to your Springs Apartments home? Share your stories with us in the comments!